Eulogies exalting the life and legacies of the late sage permeated the hall. From one family member to another, from one friend to another and to his fans present, Gimba's greatness resounded a million times like the roaring of thunder. 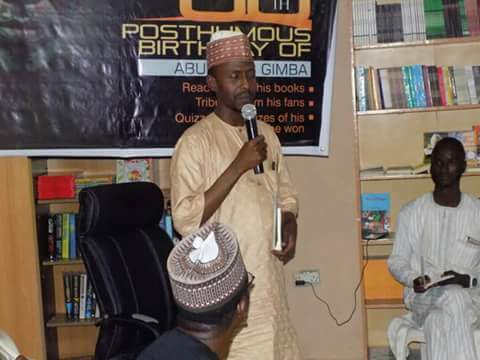 Aminu S. Muhammed, a most worthy protégé of Gimba and co-organiser of the memorial event moderated proceedings of the evening. He said that Gimba was an inspiration, a mentor and father to all who encountered him. He added that the late novelist exemplified humility, selflessness, as well as piety. 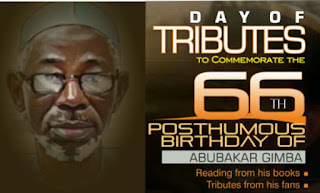 Dr. Zakari Wambai giving his tribute. Dr. Zakari Wambai, a childhood friend and in-law to Gimba rendered in subtle cadences, their early years together and the role Gimba played in his life. He described him as a caring and selfless person who always watched out for the good of others. He recounted how, as youngsters, Gimba allowed him the use of his bicycle for hours on end until he became tired and would return it but Gimba would always ask him if he was done using it?. He said Gimba went about on foot while he (Dr. Wambai) rode on his bicycle. He also related how Gimba, returning from Government College Keffi, got him eating "Madidi with sugar" and people were surprised that a young Gimba who had just returned from school could afford such a present for his younger brother. "He was a brother like no other, no one knew he wasn't my blood brother" said Dr. Wambai. Dr. Sule Gimba, the late writer’s younger brother spoke glowingly about Gimba's love and respect for women. He said Gimba held women in very high esteem. 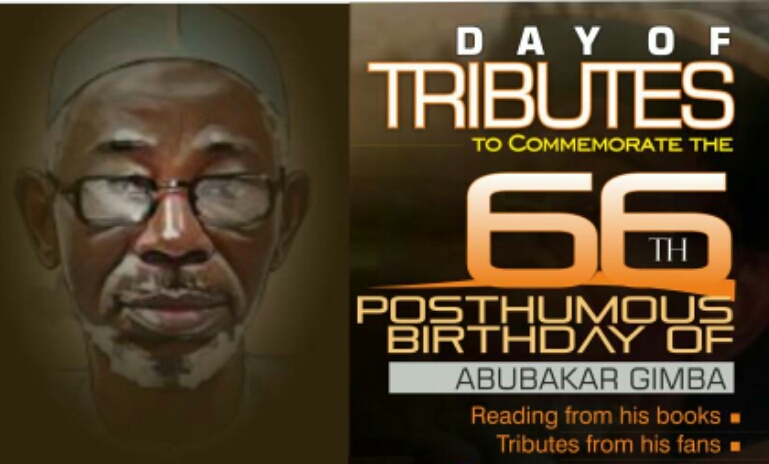 He read a passage that represents Gimba's philosophy about women, from one of Gimba's posthumous books, Oh Uhud, Thy Haunting Spirit. 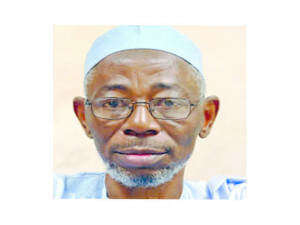 To Alhaji Mahmud Lapai, a childhood friend of Gimba, the late novelist had right from his childhood days exhibited signs of greatness and fame. He said that Gimba was very popular in primary school and enthused, "He is somebody I can never forget, never! He was a mentor." One of Gimba’s daughter, Aisha Gimba read a poem from one of his poetry volumes, "This Land of Ours" titled, "Where Are You From?". 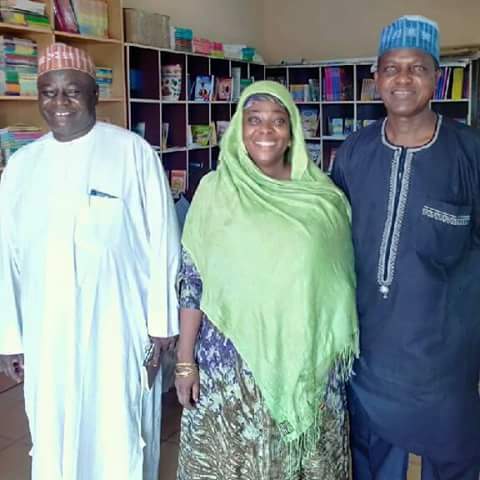 Other children that read at the event were Yaqub, Safiyyah and Haj.Aisha Abubakar Gimba. Alhassan, a grandson of Gimba also read a poem from his grandfather's book. 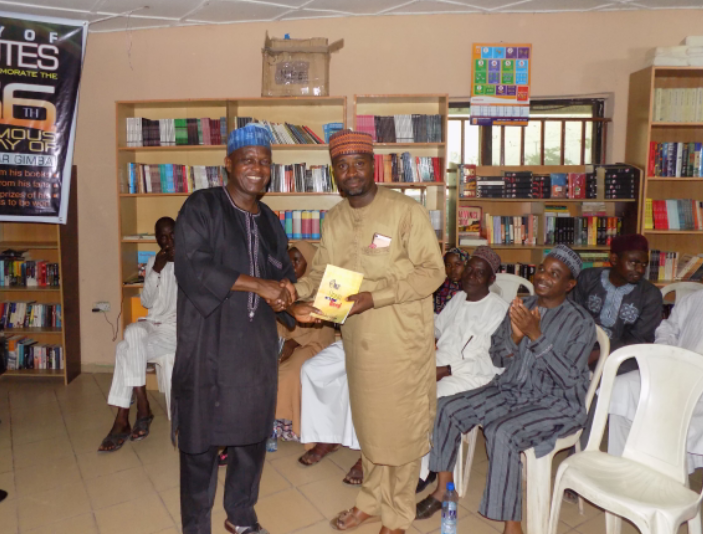 Dr. Wale Okediran, highly respected former President of the Association of Nigerian Authors (ANA) and a long-standing ally of Gimba, narrated how his friendship with Gimba started and how Gimba was instrumental to his becoming ANA President. He described Gimba as a "very loyal friend who kept to his words." Kamar Hamza, a former Chairman of ANA Niger State, spoke of Gimba's efficient management skills. He said that Gimba taught him the value of planning and management of resources. To him Gimba was an articulate businessperson who was very calculative in his financial planning. Mr. Nurdin Busari, CEO of AMAB Books and Publishing and co-organizer of the event read a passage from “Footprints” one of Gimba’s book of essays. Khalid Imam, Vice Chair of ANA Kano in his tribute praised Gimba's humility and described him as the most influential contemporary writer from Northern Nigeria to date, who became a shining star that illuminated the region and drew attention to the literary activities of the north. He said Gimba opened the region to wider literary opportunities. Several other guests lent their voices in honour of a man whose life continues to inspire years after his demise. 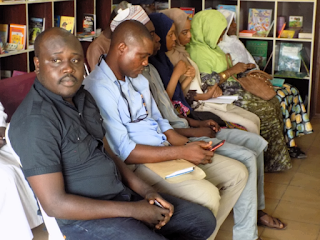 The event witnessed a brief quiz session that saw guests winning books mostly written by the late author. The amazing Hajiya Aisha Gimba, his eldest child, who has been at the forefront of ensuring that the legacies of her late father continue to be celebrated, led children of the late author to the event. The event ended a few minutes to the hour of seven pm. It was a great outing of laughter and nostalgia.